Pro-Israel Jair Bolsonaro wins 56% of the votes in second round of voting. Far-right candidate Jair Bolsonaro won a sweeping victory in Brazil's presidential election on Sunday, the BBC reported. With more than 90% of the vote counted, Bolsonaro – who has been dubbed “the Brazilian Donald Trump – had won 56% of the votes against 44% for his rival, Fernando Haddad from the left-wing Workers Party. Bolsonaro, a staunch social conservative who ran on a law-and-order platform amid a massive spike in violent crime, won the first round of the presidential election on October 7 with 46% of the vote to Haddad’s 29%. A former captain in the Brazilian army, Bolsonaro drew international attention after he compared himself to US President Donald Trump and declared himself “an admirer” of the American president. 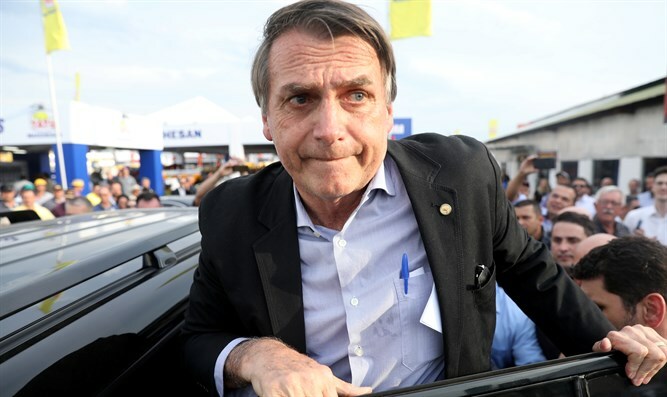 A month before the first round of the election, Bolsonaro was stabbed during a campaign rally in the city of Juiz de Fora in the south-eastern state of Minas Gerais.